Our patented Clean Fleet® technology is proven to successfully reduce emissions by 99%, dramatically decrease sound pollution and generate operational cost savings upwards of 90% of fuel costs. This technology is the first fully electric, fully mobile well stimulation system powered by natural gas in the industry. Clean Fleet® runs on electric power generated by natural gas fueled turbine generators. Consequently, fracturing operations are cleaner, quieter, safer, and less disruptive to neighboring communities. Our electric-powered Clean Fleet® advances hydraulic fracturing environmental responsibility by reducing re-fueling traffic, site noise, and emissions. While a conventional fleet must transport diesel fuel to the well site, natural gas for the turbine gen sets is delivered more efficiently directly from a pipeline. Subsequently, the use of natural gas eliminates approximately 25 diesel truck deliveries to the well site required for an average horizontal completion. This not only reduces traffic in communities, it also eliminates fire hazards and spills associated with re-fueling operations. Ultimately, the use of produced field gas reduces fuel operating costs by as much as 80%. Clean Fleet® successfully reduces hazardous emissions to near-zero levels. As confirmed by independent 3rd party testing, Clean Fleet® decreases emissions by 99% compared to conventional diesel powered fleets, all but eliminating environmental exposure to pollutants such as nitrogen oxides (NOx) and carbon monoxide. Specifically, NOx emissions measured on the turbine exhaust stacks were found to be 0.036 grams per kilowatt hour (g/kW-hr) which is a drastic reduction compared to the Environmental Protection Agency’s (EPA) requirements for off-highway diesel engines. This reduction is achieved by eliminating all conventional diesel engines and replacing them with electric motors powered by natural gas generators. Clean Fleet® technology also eliminates methane slip issues observed in dual fuel technology applications. Clean Fleet® with Whisper Technology is the industry’s foremost solution for quiet, low noise impact hydraulic fracturing. Clean Fleet® well stimulation technology significantly reduces noise pollution, making the workplace safer and less disturbing to surrounding communities. Conventional diesel stimulation sites are extremely loud with some locations measuring as high as 129.5 decibels one foot away from the equipment. U.S. Well Services employed a third party to perform a sound survey of the electric fleet and compared it to a conventional site. More than 140 total monitoring locations were recorded and the result was up to a 69% reduction in the average sound pressure at the Clean Fleet® stimulation site. 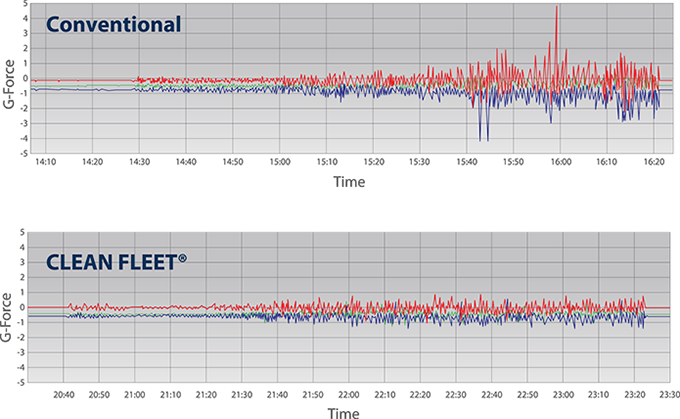 Clean Fleet® technology leads the way in advancing safety via reduced vibrations and fatigue of treating iron. Our electric fleet reduces high pressure iron vibrations by up to 80% as compared to diesel powered equipment. These results were validated by installing three dimensional (3D) accelerometers on diesel powered equipment and comparing this baseline to the accelerations recorded on the electric powered equipment (graphs below). This dramatic reduction in vibrations is achieved by replacing the engine and transmission with a VFD that controls the electric motor which is direct coupled to the hydraulic fracturing pump.